As you may know, deBebians has recently begun carrying Forever One moissanite jewelry, including engagement rings, wedding bands, and necklaces. We also have loose Forever One moissanite available for purchase, making it even easier to create the exact engagement ring that you’ve been looking for. Forever One moissanite is a synthetic gemstone created by Charles & Colvard. It has color equivalent to D-F color diamonds and scores a 9.25 on Mohs scale of mineral harndess, making it ideal for every day wear. I wanted to share a few of our solitiare engagement ring settings that will look stunning if set with a Forever One moissanite. Since it’s finally fall, I wanted to share this unique solitaire engagement ring. 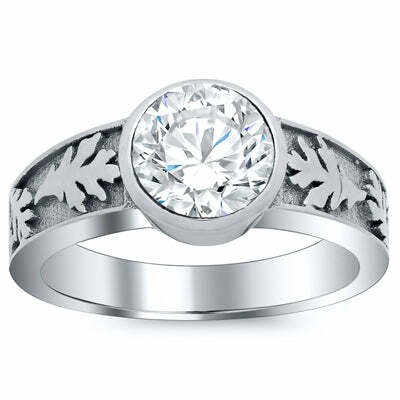 It features oak leaves on the wide band. This ring is ideal for a round brilliant cut moissanite or diamond ranging from 0.50 ct to 2.00 ct, but we could customize it for a different size or shape center stone. This knife edge solitaire engagement ring is a classic. This ring setting is a timeless design and is ideal for any center stone shape ranging from 0.50 ct to 5.00 ct. Any Forever One moissanite stone shape would look stunning placed into this setting, which will be designed and manufactured to the exact dimensions of your center stone. 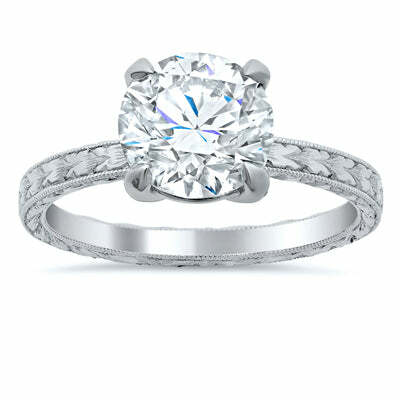 If you or your beloved prefers the look of antique engagement rings, this setting is a wonderful option. This ring is hand engraved and embellished on three sides of the band and is completed with milgrain detail. 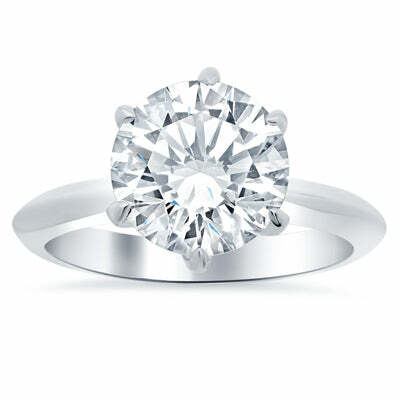 This setting can be set with any diamond or moissanite shape ranging from 0.50 ct to 5.00 ct. Learn more about moissanite from Charles & Colvard here. If you would like to browse our selection of loose moissanite stones available, please click here. As always, if you have any questions, please contact a deBebians jewelry expert and we would love to assist you.